To buy Squirrel Of Magic click here. 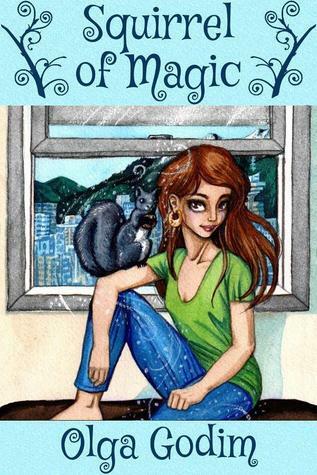 Squirrel Of Magic is a contemporary-YA book (don’t let the cover deceive you!) It’s a very refreshing read. Darya is a modern witch who is the witch-protector of her city, Vancouver. She lives the life of a common girl in Canada and has a squirrel, Beatrice (who is her familiar.) Darya and Beatrice share a magical bond which enables them to communicate through telepathy. Darya is kind-hearted, good-natured and loves helping everyone using her magical powers. Beatrice is funny and adorable. Her sarcastic comments made me laugh throughout the book. Her sense of humour is better than any squirrel! She loves mango and walnuts and of course male squirrels. Together, Darya and Beatrice solve a series of interesting mysteries. Squirrel Of Magic is a collection of some of their adventures. It’s one of those books which make you smile to yourself after reading. I really don’t know why, but this book made me feel joyous and delighted. This book has made it’s place among my favourite ones and I’m sure as hell reading it again very soon. Interview: You can read the author’s conversation with the novel’s protagonist, Darcy here. Final Thoughts: A beautiful and magical read. I love the ideal that her Familiar is a Squirrel. I don’t normally enjoy short stories but i may make an exception. Matt @ JC’s Book Haven. Hi Matt. Please do, you might actually like this one! It is a wonderful book, though a different cover might have given it the real YA feel!